I was still quite reluctant when the idea was originally floated, but it was made quite clear to me that it would be disastrous for my internal organs to continue being bathed in hot, trapped menstrual blood on a regular basis. So even though I was technically being offered a choice between wrecking my internal organs or disrupting my hormones, it was clear that only one option was actually viable. Figuring that perhaps enough time had passed since my last dalliance with this kind of medical intervention, I took the plunge. The monthly injections began and with them came some of the expected menopausal symptoms – hot flushes, insomnia etcetera. I did try two different types of Hormone Replacement Therapy, but both of them seem to entrench the PROSTAP’s side effects, so I eventually settled with taking Phyto-oestrogens in the hope that there would be some alleviation – or, at the very least, that my bones would be somewhat protected. The results were patchy at best, but I felt that the issues were something I could live with. That is until my consultant decided that I was stable enough to move to the three-month preparation. The first indication that this may have been too great a leap was the pain at the injection site. All the other injections calmed down within a couple of days, but for this one, the pain and bruising were elevated (I still have a weird skin discolouration two and half months on), and the pain lingered – leaving me with an extremely tender spot for far longer than I was expecting. Plushie Laban actually became my ‘car buddy’ for about a month as the seatbelt felt as though it was resting on an open wound. The second warning beacon was the paranoia. It engulfed me like a tomb and completely shattered my peace of mind and my sense of self. Almost all of my thoughts became catastrophic – anyone who was out of my sight was in imminent danger and the safety of our home was under constant threat. While my body was firmly rooted in London, my mind was living in a dystopian war zone. The third klaxon was the loudest. The sweats. I thought I’d been experiencing hot flushes before – boy, was I wrong! These were temperature spikes that I I no idea could be tolerated by the human body accompanied by the complete soaking of any item of clothing I was wearing on my upper body. If you’ve ever seen a contestant on the TV show Forged In Fire take a turn for the worse due to the relenting heat in the workshop you’ll have an idea of what I was going through. Each eruption felt like instant heat stroke, complete with nausea and pounding headaches. But this is where I found my “aha’ moment. A lifetime ago I did a little bit of Shiatsu training and as such, I had to ensure that I had more than just a passing understanding of energy medicine. when my husband mentioned my diaphragm it immediately brought to mind the Triple Heater. Now, my memory of the what the Triple Heater does (or doesn’t) do is beyond hazy, but after a couple of Google searches with key words such as Triple Heater and Menopause I stumbled upon an annotated image of ear acupuncture for hormone imbalances. 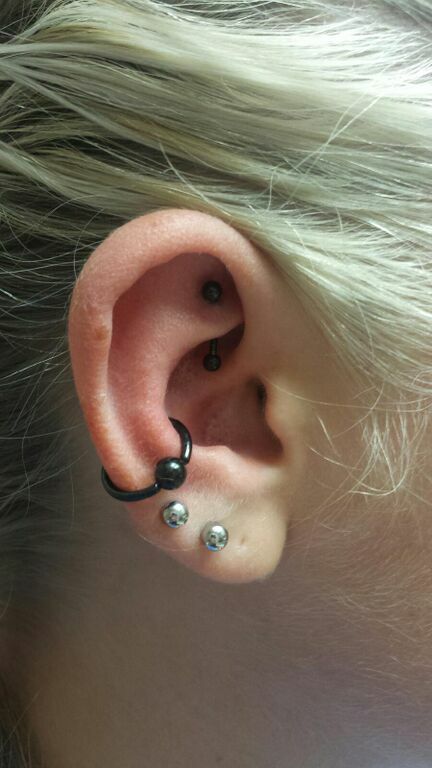 The area closest to the ear lobe (points 46/47) seemed to be the easiest to reach, so I chose that as my focus. The moment I felt the beginnings of another flush I pinched the area between my thumb and index finger and applied the strongest pressure that my hands could manage. After about thirty seconds I could feel that the Lava Monster was having difficulty in maximising its control – my temperature soon returned to the normal range. The technique was working, but pinching my ear every twenty minutes was going to be more than a little impractical – I needed a more logical way of delivering the treatment. I still get flushes of a kind, but they are much closer to what I was experiencing in the early days of getting the PROSTAP injections, without the feeling of having hot coals sewn into my stomach. But, perhaps most importantly, the paranoia has finally subsided allowing me to step down from Def Con One and just be my Martian self again. The only downsides are that after about thirty-six hours the soreness of my ear becomes quite pronounced, and if I remove the magnets for more than half an hour I am rewarded with a Migraine. At the moment I’m not sure if it’s the impromptu acupressure or the small magnetic field that is doing most of the work, but I do plan to get the area pierced once my operation is out of the way. N.B If you try this, do not use neodymium magnets – they will cut right through your ear whether you wanted a piercing or not! P.S. Isn’t it time you treated yourself to a new T-Shirt? Get your limited edition ‘Bad Attitude’ Tee here! I’m definitely going to try the pressing the inner ear lobe thing when I flush! Thanks! Can you take pictures of the magnet thing you’re trying? Is it an earring? Or ear cuff? Oh okay, the picture helps a lot. Thanks! Previous Previous post: Forget Coffee And Grab Yourself A Tee! Next Next post: I Have A Penchant For Rejecting Talking Therapies. How Do I Overcome This?